After years of conflicting information, many people remain confused about the alleged association between soyfoods and cancer risk. Here’s an update on the latest research that supports their safety and protective effects. The link between soy and cancer risk has been a controversial topic for some time and has confused many people. Not only is the general public often baffled by whether soy is safe to eat, but many dietitians report being uncertain of what to tell their clients. Finding an answer isn’t always easy with the tremendous amount of misinformation floating around—not to mention the fact the research has appeared contradictory over time. To get to the bottom of the soy and cancer debate, Today’s Dietitian turned to experts from cancer societies as well as dietitians who have been keeping up with the latest research to help clarify some key issues and give you the best information and message to convey to clients and patients. The confusion about soy stems from the fact that studies on its relationship to cancer have been conflicting, says Sharon Palmer, RD, author of The Plant-Powered Diet. “Some studies found protective benefits against cancer, but others showed concern for increased risk.” However, a closer look at the previous research as well as the most current findings reveals plenty, she adds. Messina’s 2011 study in The American Journal of Clinical Nutrition looked at the fact that mice metabolize isoflavones differently than humans. He says that even in the rodent model, not all studies show that genistein stimulates tumor growth. 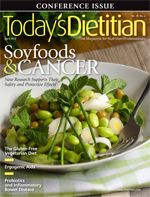 In general, studies in Asian women have found a lower risk of breast cancer with greater soyfood consumption, but Marji McCullough, ScD, RD, strategic director of nutritional epidemiology at the American Cancer Society, agrees that part of the challenge in studying this topic in the United States is that women eat much less soy than women in Asia. McCullough adds that the American Cancer Society’s 2012 Nutrition and Physical Activity Guidelines for Cancer Survivors concluded that current research finds no harmful effects from breast cancer survivors eating soy. Some of the confusion surrounding soy comes from animal research suggesting it’s safer to eat it in whole foods instead of processed forms. Messina says research indicates the greater the amount of processing, the greater the tumor growth in rodents. “This observation is primarily responsible for healthcare organizations concluding that soyfoods are OK, but supplements may not be,” he says. Still, while Messina has many reasons for recommending whole soyfoods over supplements—in the same way he’d recommend apples over apple juice—he comes back to the fact that the effects of processing on tumor growth in rodents isn’t applicable to humans. Of course, it doesn’t hurt to remind clients that processed soy is still processed food, and whole food is a healthier choice. Both Collins and McCullough add that they get numerous questions about soy’s safety and witness much lingering doubt. Collins says the fact that research has evolved over time means that many health professionals may be giving different answers to questions about soy’s safety. “When people ask their doctor, nurses, or even RDs, depending on what research those health professionals last read, people may get very different answers,” she explains. The good news is that education on the most recent research can allay some of those fears. Therefore, dietitians have an important responsibility to keep up with the latest research, Palmer says. McCullough says she’d like to see dietitians become familiar with the American Cancer Society guidelines on nutrition and physical activity for cancer prevention and the guidelines for cancer survivors as well as global guidelines from the World Cancer Research Fund/American Institute for Cancer Research. • Soy is a healthful alternative to meat. • Fermented soy products are much higher in sodium (eg, miso). • Soyfood consumption is safe for women and breast cancer survivors, and some studies have shown a lower risk of breast cancer and recurrence. • Make tofu: Tofu can be stir-fried, grilled, added to stews and soups, and used in mixed dishes such as lasagna. • Prepare tempeh: Tempeh is a great addition to chili and pasta sauce. • Drink soymilk: Soymilk can be used in smoothies and on cereal. • Eat edamame: Edamame can be used in soup, stir-fries, and salads or eaten as a snack. • Munch on soybeans: Roasted soybeans (aka soynuts) can be eaten as a snack or added to salads. 1. Onoda A, Ueno T, Uchiyama S, et al. Effects of S-equol and natural S-equol supplement (SE5-OH) on the growth of MCF-7 in vitro and as tumors implanted into ovariectomized athymic mice. Food Chem Toxicol. 2011;49:2279-2284. 2. Nechuta SJ, Caan BJ, Chen WY, et. al. Soy food intake after diagnosis of breast cancer and survival: an in-depth analysis of combined evidence from cohort studies of US and Chinese women. Am J Clin Nutr. 2012; 96(1): 123-132.